This is NOT your ordinary wicker chair. It’s a Pottery Barn chair! Which can only mean one thing: this chair was made entirely of sea grass . . . SUSTAINABLE sea grass! Naturally everybody and their dog wants to know how Pottery Barn makes a chair out of sustainable sea grass. How? how? how? everybody asks! Woof? Woof? Woof? asks everybody’s dogs. What does Pottery Barn mean by seagrass? Pottery Barn knew you wouldn’t know that. Like most Americans, you have probably never spent much time, if any, walking around on the bottom of the ocean like Pottery Barn has. But if you did, you would find that on the bottom of every ocean is a gigantic lawn where sea creatures of all shapes and sizes bring their families to relax, play croquet and run three-tentacled races. What does Pottery Barn mean by sustainable? You don’t get out much do you? After paying out beaucoup bucks and attending umpteen seminars on global warming and adhering to strict guidelines ad nauseam, PB has become licensed by Al Gore, himself, to use the word sustainable to describe a person, place or thing in Pottery Barn catalogs until well past the year 2017. What does Pottery Barn mean by sustainable seagrass? You would ask that. Sustainable seagrass is any seagrass that has been painstakingly trimmed by the very fingers of Al Gore, himself, in such a way as to make it grow back quickly and also in such as way as to give Al Gore a killer back ache in such a way as to cause Al Gore to hire a female masseuse to come to his room and give him a massage in such a way as to cause Al Gore to act so weird his wife divorces him. 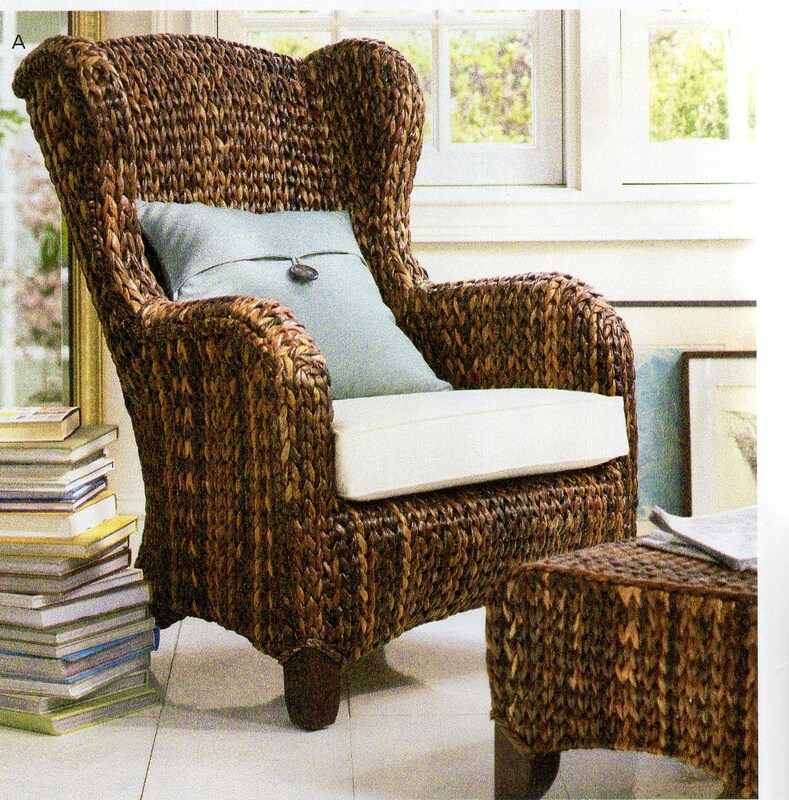 But how does Pottery Barn make a chair out of seagrass? Nosy aren’t you? Again the answer lies with Al Gore. As you may or may not know, Al Gore used to be the Vice President of the United States of America where he spent hours upon hours snacking on Funions and waiting for something untoward to happen to Bill Clinton. He managed to keep busy by inventing a process he calls braiding. But why does Pottery Barn call itself a pottery barn when it is clearly a store? Go away kid you bother me. ← Trifecta Weekend Writing Challenge Try 2: Herbert Huv Gets the Heave Ho! Yes. I love the Pottery Barn posts. And I can totally picture Al Gore braiding seagrass from the comfort of his non-green home. That crazy Al and his crazy sidekick Leo. Thank goodness they have helped PB to become sustainable and eco-friendly by teaching them all there is to know about braiding seagrass. Also, Al Gore really gorged on those funions post office. Well I know that when we saw him in person at the Evergreen Oil speech that time he was late because his quarter got jammed while he was trying to buy a bag of Cheetos . . .or maybe I made that up . . . well it was either one of those! 1) read Harper’s hilarious blog and then when he comments back about my blog add his blog to my blog roll. 7) Go to bed and dream about Harper’s blog. 10) add Harper’s link to my blogroll. See what I mean about the coincidence!!! Already done! Haha nanny nanny! In case you haven’t noticed by now I am the world’s worst typist and proofreader. I was a secretary for many years, a horrible one I might add! If they would have made a mug that said “World’s Number 7,014,840,893 Secretary!” That’s what my boss would have gotten me for every occassion . . .ocassion? Coincidene my A (l Gore)! I don’t think so . . . on the other hand now that I think about it everybody in my family is Asian except for me . . . do you think that means something? Wait – at the end of the post, do you mean you love us more than Pottery Barn loves us, or you love us more than you love Pottery Barn? Why do you always make me laugh? Why? Woof? It’s this hat, isn’t it? No one ever takes me seriously when I wwear this hat. Well I wasn’t going to say anything . . . but yes lose the hat! What you need is an attractive pair if spats! What I want to know is what happens to a sustainable seagrass chair from Pottery Barn when your grandkids spill KoolAid on it? If you’re going to write a FAQ’s, please be kind enough to include the important stuff. Good Call! Reprimand acknowledged ntexa99! Boy you’re strict!! I’ve got a call into them and they’ve got me on hold . . . — just to clarify. . .you’re talking about the Pottery Barn Kool-ad you were drinking at the time . . . ? http://goldenink.com/humor/algore.html <– you can find some hilarious quotes by Al Gore here! Lol! Good old Pottery Barn! It’s the catalog that keeps on giving! Who knew the words “sustainable” and “sea grass” would be coupled so easily with Al Gore and Funions! Linda, I have to thank you for answering that burning question… Who invented “Braiding?” It’s plagued me for years. I should have known that Al Gore was the inventor! I feel so stupid! LOL Mark!! Well you better hurry — I think they start setting up the food for the ocean lawn potluck and if you don’t get there early Al “i’m getting fatter by the minute” Gore might beat you to it! And don’t forget to wear your Santa Suit, just cause it might go nicely with the snorkel. 😀 Hahaha! Yes! *spitting on hands as well as the PB Catalog* I must go check it out. Please send link ASAP! I’m really enjoying thee theme/design of your webb site. Do you ever run into anyy browser cojpatibility issues? Do you have any recommendations to help fix tnis issue?